St. Ji He baptized Thomas….. He was full of zeal from his youth…..He loved most to pray in church,,,,, St. Ji He never married He was honest, upright, and reticent,,,,,,,They were also martyred together. Both now in heaven, they remain close friends. 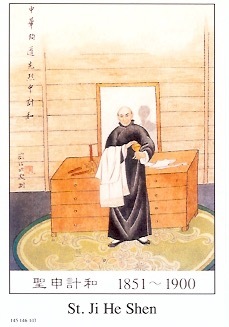 St. Ji He died at the age of forty-nine.